Created by Frank and Marjorie Lawley since 1976 this small (1 acre) new country garden is based on 17th Century lines. It is situated in the old farmyard around a possibly 16th Century farmhouse. 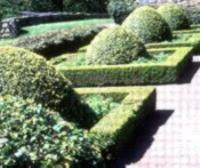 There a five parts to the garden: a formal topiary "green" garden, a physic garden, a large flower garden and a fancy garden with parterre and gazebo. There is also a nursery garden where plants from the garden collection can be purchased, in addition to a small video/DVD/CD collection and a history/guide. The planting plans and photographs showing the early garden construction are shown in the gazebo. 2 miles north of Cambo just off B6342 (signposted Hartington). 23 miles North West of Newcastle.